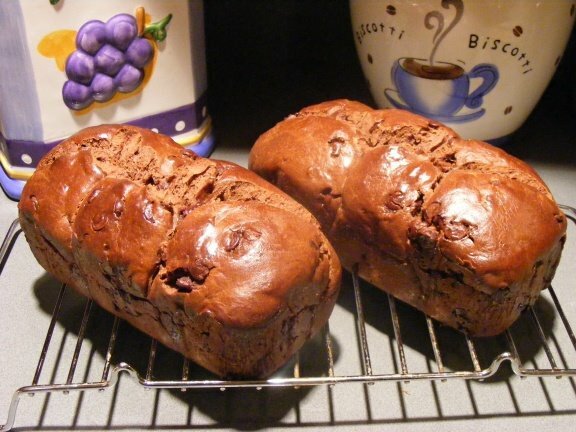 Almost a year ago, I came upon this recipe for Chocolate Bread. Why did it take me so long to bake it? God only knows. But I finally did, and it was worth the wait. While the final product is supposed to be have a “feathery yet rich texture,” mine was denser, with a tighter crumb and a chewy crust. My guess is that, given the distinct chill in my house, I didn’t allow enough time for the dough to rise before punching it down. The flavor, however, is wonderful. The bread has a rich cocoa flavor accentuated by its chunks of dark chocolate. It tastes delicious alone but imagine spreading it with mascarpone cheese and topping it all off with a dollop of raspberry preserves? Mmm, divine. In a small bowl, combine 1/2 cup of the warm water with 1 teaspoon of the sugar. Sprinkle the yeast over the water and set the mixture aside for 10 minutes, until foamy. If the mixture doesn’t foam, the yeast might be inactive and you should try again with fresh yeast. In the bowl of a heavy-duty electric mixer, place the flour, the remaining 2/3 cup of granulated sugar, the light brown sugar, the cocoa, the espresso powder (if using) and the salt. Using the paddle attachment, mix at low speed for 1 minute, until combined. If mixing by hand, use a whisk and combine thoroughly. Add the remaining 1 cup warm water (or warm coffee, if not using the espresso powder) and the egg to the yeast mixture. Add this to the flour mixture while continuing to mix at low speed. Increase the speed to medium and continue to beat the mixture for 2 minutes, or until the dough is smooth and elastic. At low speed, beat in the softened butter 1 tablespoon at a time, until it is incorporated into the dough. Remove the paddle attachment and replace it with the dough hook. (Alternatively, you can knead by hand. Just make sure the butter is well softened.) Knead the dough at low speed for 2 minutes. Increase the speed to medium and knead the dough for 2 minutes longer. Add the chocolate chunks and knead just until incorporated. Transfer the dough to a buttered bowl (the dough will be quite moist). Cover the dough closely with plastic wrap or a damp tea towel and allow to rise in a warm, draft-free place for 2 hours (or until almost doubled in bulk). After the chocolate dough has risen, punch the dough down and cover again with plastic wrap. Place the dough in the refrigerator for at least 8 hours or up to 2 days. Butter two 8 1/2-by-4 1/2-by-2 1/2-inch loaf pans. On a lightly floured work surface, divide the chocolate dough in half. Divide each dough half into 6 equal pieces so that you have 12 equal pieces in all. With lightly floured hands, shape each piece into a smooth, round ball. Place 6 dough balls — two by two, at a diagonal (see photo above) — in each prepared pan, pressing them lightly together if necessary. Cover the pans with a tea towel and allow the dough to rise at room temperature for 1 hour. Position a rack in the center of the oven and preheat to 400 degrees. In a small bowl, whisk together the egg and water until blended. Using a pastry brush, brush the egg glaze over the tops of the loaves. Bake the loaves for 10 minutes. Lower the oven temperature to 375 degrees and bake the bread for an additional 30 minutes. Cool the bread in the pans set on a wire rack for 15 minutes. Unmold the bread and cool the loaves on the rack completely.